Tens of thousand of protesters are expected to be present on Friday and Saturday. Many demonstrators are campaigning on anti-war, anti-globalisation, anti-capitalist and disarmament platforms. 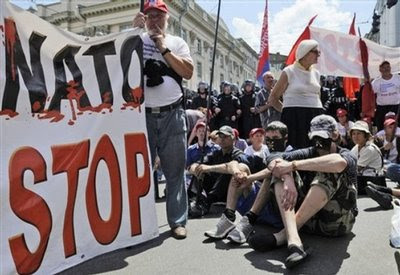 Police have clashed with several hundred protesters, with scores of people being arrested, ahead of a Nato summit in Strasbourg. Officers used tear gas and fired rubber bullets at the protesters who smashed cars and windows in the eastern French city on Thursday. Strasbourg is hosting the group's 60th anniversary summit on Friday and Saturday and is awaiting world leaders. About 200 masked protesters and 40 riot police officers confronted each other in the neighbourhood of Neuhoff, in the southern area of Strasbourg near the German border. Police arrested about 100 anti-Nato demonstrators as they tried to march on the centre of the city from a "peace camp" in the southern suburbs. Bus stations were smashed, rubbish bins set fire to and a barricade set up in the street. Rocks and bottles were thrown at officers before police marshalled the demonstrators back towards their camp. Calm was restored by early evening, according to police. A total of about 800 protesters were present in total. 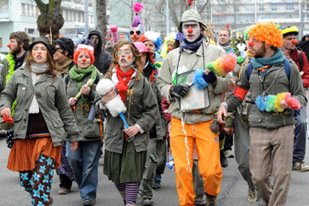 Street protests of tens of thousands of people are predicted to take place during the summit and 25,000 police officers are on alert to react to any problems. About 2,000 of the demonstrators are considered by authorities to be violent and dangerous. Many shops and small businesses have closed for the duration of the summit. This threat to the summit's smooth running comes alongside any potential attack related to opposition to Nato's war in Afghanistan. Kehl and Baden Baden, the two other towns co-hosting the summit in neighbouring Germany, are preparing for similar disturbances. Hamish Macdonald, Al Jazeera's correspondent in Strasbourg, said: "This was essentially a preliminary protest that was taking place. "The big protest is planned for Friday but [there will be] another one also on Saturday. So obviously there's plenty of time left for things to get difficult for the security forces. "I don't think they [the security forces] were expecting trouble this afternoon. There is an enormous security presence here. "There are some particular groups the authorities are worries about. One is called the Black Group ... [who] are known to have the intent to cause damage to property." Some groups are calling for the withdrawal of Nato troops from Afghanistan and the disbanding of the military alliance. Nato troops entered Afghanistan after the US-led 2001 invasion to end control of the country by the Taliban, who were providing safe havens for al-Qaeda fighters.